A symbol of the city, the Gros Horloge (Great Clock) lies in the heart of the old town. 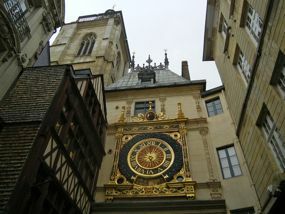 The beautiful golden clock called the Gros Horloge is the center of old Rouen. Visitors will pass under its archway and hear its chimes throughout the city. You'll walk under the Gros Horloge going between the Cathedral and the Place du Vieux Marché. Located in a specially constructed arch, the Gros Horloge was formerly in the belfry which abuts it. Climbing the belfry (steep spiral staircase) gives access to the clock mechanism and the town bells. The top of the belfry also provides a magnificent view of the city of Rouen. The city is full of charming old half-timbered houses. Above, The Gros Horloge, Rouen, France. 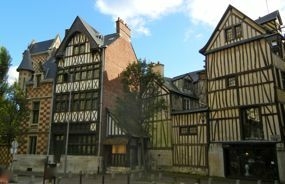 Below, Half-timbered houses in old Rouen.